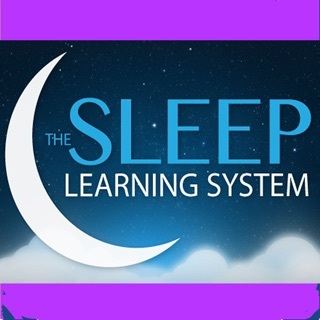 7 Advanced Binaural Dream Induction Programs in One App! 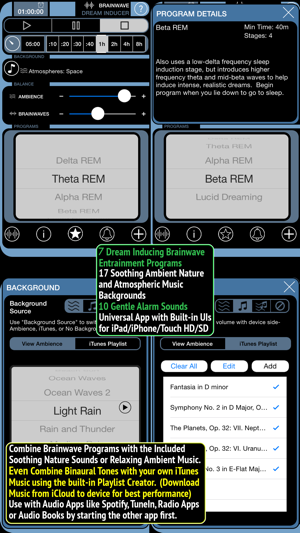 Dream Inducer combines soothing ambient sounds with powerful binaural sequences to synchronize your brainwaves with frequencies associated with 7 different levels of dreaming. 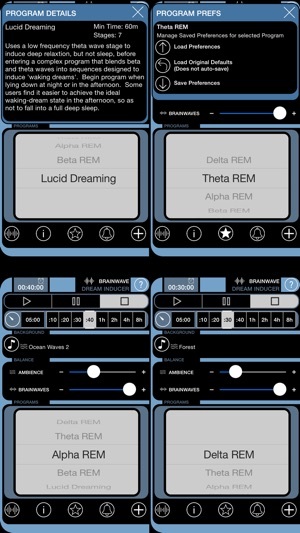 * Universal iOS App supporting iPhone/iPod Touch/iPad HD/SD * Supports iOS 7.0 and higher * Each program includes a sleep induction phase and then introduces progressively higher frequency Alpha, Beta and Theta dream sequences to stimulate increasingly vivid dreams. human brain if two different audible frequencies are played separately into each ear with headphones or earbuds. associated state of mind will be induced. 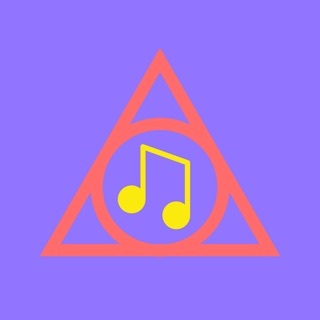 Dream Inducer improves upon basic binaural techniques by layering multiple signals and then assembling these into sequences of programs that combine to create extremely unique experiences. 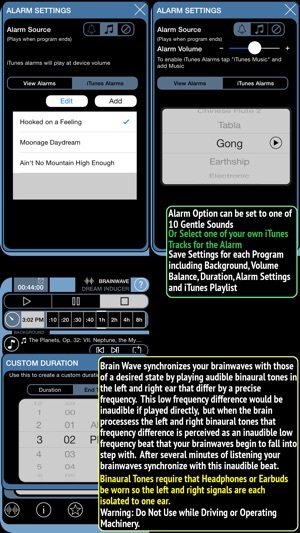 Thanks for making BrainWave the top-selling brainwave entrainment apps in the App Store for 8 years. This version includes language translations for Chinese Simplified and Japanese. I’ve had on-going sleep issues for years. Busy days lead to difficulties turning off and putting the day behind me. 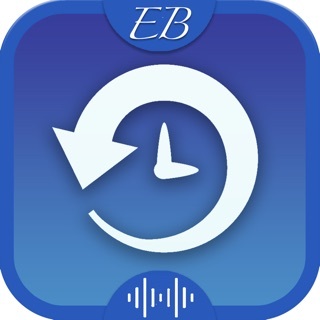 I used to use a white noise machine and that helped a bit, but then I discovered this app. I’ve been using it now every night for close to a year and it has made a huge difference in my quality of sleep (I use it with noise-canceling earbuds). It’s just the right combination of distraction and relaxation. 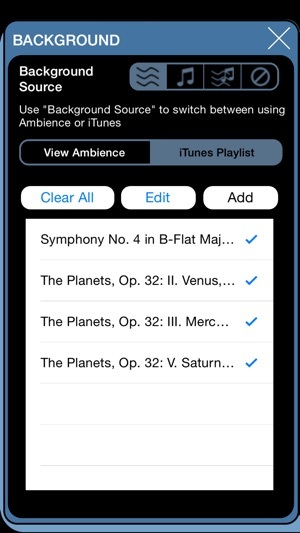 Also, in a recent update (prior to the Sept. 21 update), a small audio problem cropped up. I contacted the developer and got an immediate and personalized response AND they fixed the problem with this most recent update. 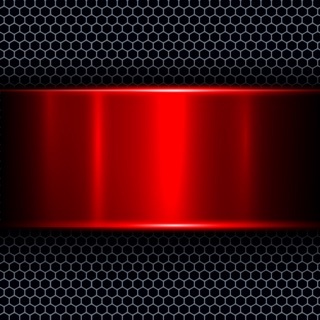 This is an awesome app that I highly recommend!! 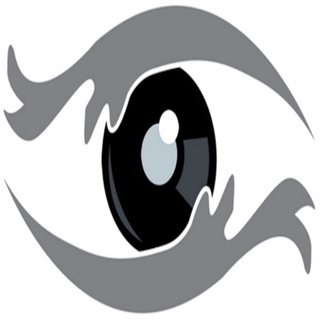 This worked well for controlling a daydream-like state. I was relaxed and able to get very into a dream while being awake. It’s like self-guided meditation. For me the beach has always been relaxing. The sound is very real, but I turned the volume to a realistic level, not too loud. Then I pictured walking on one of the many beaches I’ve been to. Remembering the feel of the sun on my face and sand under my feet, the smell of the air, and the wind blowing my hair. The details brought me there to the relaxed state and made it feel real, then I just directed my thoughts from there. I’m trying the forest sounds next! 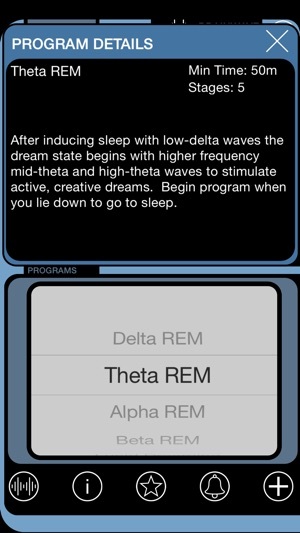 This is my favorite night time brain entrainment program. I have purchased so many over the last few years, some very pricey! I always end up coming back to this one. I have struggled with insomnia for many years and while this is not a magic pill, it’s one of my top 3 tools in my arsenal for night time sleep support. For those who write that it’s just noise- note there are levers to mix the volume of binaural beats and volume of background sound to create a custom sound. I highly recommend!